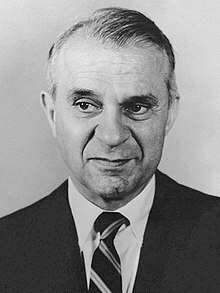 Wassily Wassilyevich Leontief (Russian: Василий Васильевич Леонтьев; August 5, 1905 – February 5, 1999), was a Russian-American economist known for his research on input-output analysis and how changes in one economic sector may affect other sectors. Wassily Leontief was born on August 5, 1906, in Munich, Germany, the son of Wassily W. Leontief (professor of Economics) and Zlata (German spelling Slata; later Evgenia) Leontief (née Becker). W. Leontief, Sr., belonged to a family of old-believer merchants living in St. Petersburg since 1741. Genya Becker belonged to a wealthy Jewish family from Odessa. At 15 in 1921, Wassily, Jr., entered University of Leningrad in present-day St. Petersburg. He earned his Learned Economist degree (equivalent to Master of Arts) in 1925 at the age of 19. Leontief sided with campaigners for academic autonomy, freedom of speech and in support of Pitirim Sorokin. As a consequence, he was detained several times by the Cheka. In 1925, he was allowed to leave the USSR, mostly because the Cheka believed that he was mortally ill with a sarcoma, a diagnosis that later proved false. He continued his studies at the Frederick William University and, in 1928 earned a Ph.D. degree in economics under the direction of Werner Sombart, writing his dissertation on The Economy as Circular Flow (original German title: Die Wirtschaft als Kreislauf). In 1949, Leontief used an early computer at Harvard and data from the U.S. Bureau of Labor Statistics to divide the U.S. economy into 500 sectors. Leontief modeled each sector with a linear equation based on the data and used the computer, the Harvard Mark II, to solve the system, one of the first significant uses of computers for mathematical modeling, along with George W. Snedecor's usage of the Atanasoff–Berry computer. In 1932, Leontief married poet Estelle Marks. Their only child, Svetlana Leontief Alpers, was born in 1936. Leontief's wife Estelle wrote a memoir, Genia and Wassily, of their relations with his parents after they came to the US as emigres. Leontief is credited with developing early contributions to input-output analysis and earned the Nobel Prize in Economics for his development of its associated theory. He has also made contributions in other areas of economics, such as international trade where he documented the Leontief paradox. He was also one of the first to establish the composite commodity theorem. Leontief used input-output analysis to study the characteristics of trade flow between the U.S. and other countries, and found what has been named Leontief's paradox; "this country resorts to foreign trade in order to economize its capital and dispose of its surplus labor, rather than vice versa", i.e., U.S. exports were relatively labor-intensive when compared to U.S. imports. This is the opposite of what one would expect, considering the fact that the U.S.'s comparative advantage was in capital-intensive goods. According to some economists, this paradox has since been explained as due to the fact that when a country produces "more than two goods, the abundance of capital relative to labor does not imply that the capital intensity of its exports should exceed that of imports." Leontief was also a very strong proponent of the use of quantitative data in the study of economics. Throughout his life Leontief campaigned against "theoretical assumptions and non-observed facts". According to Leontief, too many economists were reluctant to "get their hands dirty" by working with raw empirical facts. To that end, Wassily Leontief did much to make quantitative data more accessible, and more indispensable, to the study of economics. Wassily W. Leontief (Aug 1936). "Quantitative Input and Output Relations in the Economic System of the United States". Review of Economics and Statistics. 18 (3): 105–125. JSTOR 1927837. Wassily W. Leontief (Aug 1937). "Interrelation of Prices, Output, Savings and Investment: A Study in Empirical Application of Economic Theory of General Interdependence". Review of Economics and Statistics. 19 (3): 109–132. JSTOR 1927343. Wassily W. Leontief (Aug 1967). "An Alternative to Aggregation in Input-Output Analysis and National Accounts". Review of Economics and Statistics. 49 (3): 412–419. JSTOR 1926651. Wassily W. Leontief (Aug 1970). "Environmental repercussions and the economic structure: an input-output approach". Review of Economics and Statistics. 52: 262–271. JSTOR 1926294. Wassily W. Leontief (1970). "The Dynamic Inverse". In A.P. Carter and A. Brody (ed.). Contributions to Input-Output Analysis: Proc. 4th Int. Conf. on Input-Output Techniques (1). North-Holland Publishing Company. pp. 17–46. Wassily W. Leontief (1986). Input-Output Economics (2nd ed.). New York: Oxford University Press. ISBN 9780195035278. Leontief is listed in the Russian-American Chamber of Fame of Congress of Russian Americans, which is dedicated to Russian immigrants who made outstanding contributions to American science or culture. ^ "The Sveriges Riksbank Prize in Economic Sciences in Memory of Alfred Nobel 1973". NobelPrize.org. ^ Harvard IOHP | Khodadad Farmanfarmaian Transcripts. Fas.harvard.edu. Retrieved on 2017-09-06. ^ See birth data, provided October 4, 2005 Archived January 14, 2007, at the Wayback Machine. In his Nobel Prize website biographical information it states that recent information sets his year of birth to 1905. ^ a b Kaliadina, Svetlana A.; Pavlova, Natal'ia Iu. ; Wittich, Claus (2006). "The Family of W. W. Leontief in Russia". Economic Systems Research. 18 (4): 335. doi:10.1080/09535310601020876. ^ a b Estelle Leontief (1987). Genia & Wassily: a Russian-American memoir. Zephyr Press. ISBN 978-0-939010-11-0. ^ Lay, David C. (2003). Linear Algebra and Its Applications (Third ed.). Addison Wesley. p. 1. ISBN 0-201-70970-8. ^ Polenske, Karen R. (2004). "Leontief's 'magnificent machine' and other contributions to applied economics". Wassily Leontief and Input-Output Economics. Cambridge University Press. p. 12. ^ See also, Leontief, Input-Output Economics (Scientific American, 1951) reprinted in Input-Output Economics (1966). ^ Iverson, Kenneth E. (1954). Machine Solutions of Linear Differential Equations Applications to a Dynamic Economic Model, Ph.D. Thesis. Harvard University. ^ PageRank-Type Algorithm From the 1940s Discovered – Slashdot. Science.slashdot.org (2010-02-17). Retrieved on 2017-09-06. ^ Scientist Finds PageRank-Type Algorithm from the 1940s – MIT Technology Review. Technologyreview.com (2010-02-17). Retrieved on 2017-09-06. ^ a b "Wassily Leontief (1906–1999)". Econlib. Library of Economics and Liberty. 5 May 2014. Retrieved 5 May 2014. ^ Wassily Leontief (1986). Input-output Economics. Oxford University Press. ISBN 978-0-19-503527-8. ^ European Russians: The place of Russian Emigration in US Science and technology. Eurorussians.com. Retrieved on 2017-09-06. ^ Anatoly Bezkorovainy (2008). All Was Not Lost: Journey of a Russian Immigrant from Riga to Chicagoland. AuthorHouse. p. 457. ISBN 9781434364586. Retrieved August 15, 2017. ^ CRA Hall of Fame. Russian-americans.org. ^ Leontief, W., Theoretical Assumptions and nonobserved Facts, American Economic Review, Vol. 61, No. 1 (March 1971), pp. 1–7; Presidential address to the American Economic Association 1970. Wikimedia Commons has media related to Wassily Leontief.